As a person who suffers from a lot of hormonal problems, I have always been a bit concerned about plastics. Since Matilda is formula fed, I was concerned when I heard about Bisphenol A or BPA. Many popular baby bottles such as Avent, Dr Browns and Playtex are made of a hard clear plastic which supposedly leach chemicals into the formula. 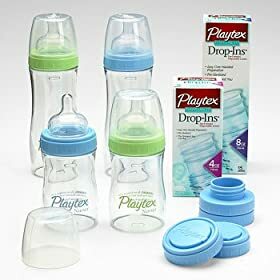 It turned out that the bottles we were using (Playtex with the Drop In liners) are BPA free, so we didn’t have anything to be concerned about. We also bought BornFree sippy cups which are BPA free and a Playskool straw cup. How do you know if a bottle, or other container is BPA free? Make sure that the plastic is not super hard. It should give slightly when you press it and it should be a little cloudy. Also, things that have a #7 recycle sign contain BPA, such as Lexan and Naglene. Oh by the way, the playtex bottles pictured appear to be made of hard clear plastic, because they are. However, you use liners that you drop into the bottle. So the hard clear plastic doesn’t actually touch the liquids in the bottle. Thus, they qualify as BPA free.